Sawzall or other cutting device. Step 1. 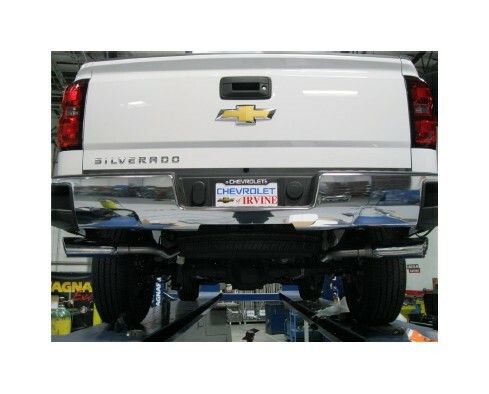 To remove the OEM exhaust system, you will first need to cut the pipe behind the muffler before it goes over the axle. You can then disengage the welded hangers from the rubber insulators and remove the tailpipe. 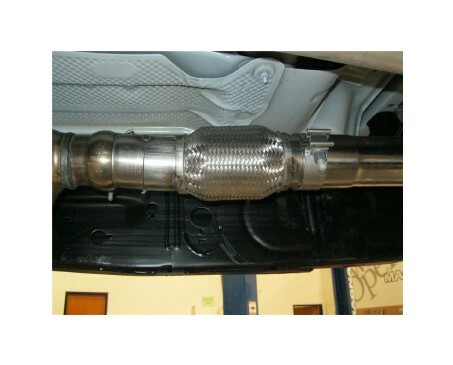 Unfasten the muffler inlet from the catalytic converter at the clamp junction. Do not damage or discard the OEM fasteners or rubber insulators, as they will be reused to mount the new system. Disengage the muffler hangers and remove it from the vehicle. Step 2. Before installing your new system, to convert the vehicle to dual tips you must install the supplied threaded hanger into the driver side frame rail with the supplied fasteners as shown. Step 3. 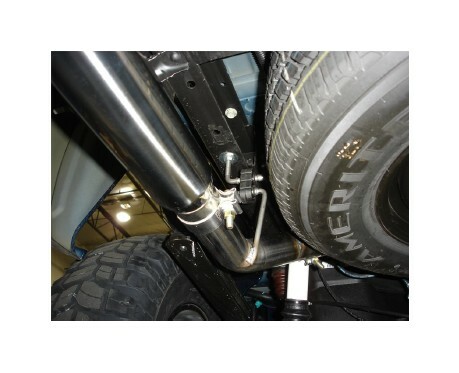 Install the new Inlet Pipe Assembly at the ball flare using the OEM clamp. Leave all clamps and fasteners loose for final adjustment of the complete system. Step 4. Working front to rear install the remaining pieces of the MAGNAFLOW system, inserting hangers into rubber insulators and loosley intstalling suppled clamps. Adjustable tips are supplied to fit a variety of aftermarket bumpers and rollpans, once a position is decided for the tips it is recommended to have them welded into place. Step 5. Once a final position has been chosen for the new exhaust system, evenly tighten all clamps from front to rear using the torque specifications on page one of the instructions. Inspect all fasteners after 25-50 miles of operation and re-tighten if necessary.